I remember the times when I had a little kitchen garden.. the lovely bushes of mint was always the star of the vegetable section. Now, I have some mint in my garden which I use for tea & salads… it has still to grow so that I can use it lavishly. If you have a bunch or quite a few mint leaves & do not know what to do with it.. just go ahead & add it to your curry & check out the difference! You will be amazed at the wonderful aromatic flavor it imparts to the gravy. My home was filled with the heavenly aroma of mint when I made this curry & my family just loved it!! This lovely minty curry is so finger licking good that you must treat yourself & the ones you love with this yummy green treat!! ½ tsp. fresh Garam Masala pwd. Cut the chicken breasts into desired pieces, wash & drain completely. Heat oil in a deep pan/handi/dekchi on med. heat. Saute the sliced onions till soft & lightly brown. Drain the fried onions using a slotted spoon & keep aside. In a masala grinder/blender, grind together fresh mint, coriander, fried onions, coriander pwd., garlic-ginger pastes, green chillies, turmeric, cumin pwd. green cardamom & garam masala pwd. using sufficient water to a smooth & thick paste. Apply this masala paste to the chicken pieces along with a little salt & marinate for about ½ an hour. Rinse the grinder & reserve the masala liquid for further use. Heat the same pan in which the onions were fried till hot. Reduce heat & add the marinated chicken & saute till rawness disappears & you get a good aroma. Then add in the tomato puree, tamarind paste, a pinch of sugar & saute for about 2 mins. Add the reserved masala liquid & sufficient water depending on the desired curry/gravy consistency. Adjust salt to taste. Let the curry come to a boil & then allow it to simmer for about 5 mins. Switch off heat & let the curry rest for awhile for the flavors to meld. Garnish the fresh mint chicken curry with freshly chopped mint & coriander. Serve with steamed rice, pulao, jeera rice, chapattis, phulkas, rotis or any bread of your choice. 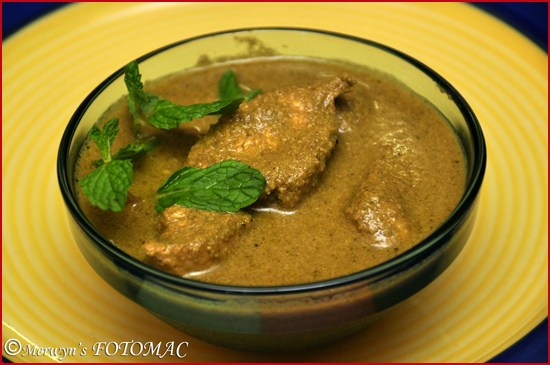 To retain the fresh green color of the curry do not use curds/dahi/yoghurt & red chilli powder. Do not also use too much tomato puree. If you like the curry very spicy then increase the green chillies or retain the seeds.